Limited availability. Must schedule in advance. All New Glow Wars NOW AVAILABLE! 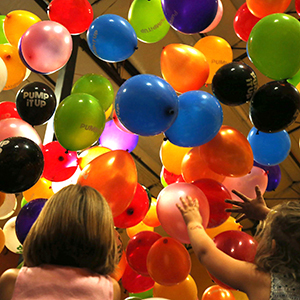 Add to any party package for an additional $55 for up to 25 kids. Additional kids over the 25 included are $4.95 each (maximum of 30 children). Kick our Glow Party up a notch with Glow Wars! 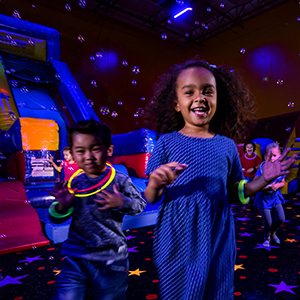 This experience includes Glow Laser Lighting, Glow Necklaces and the use of our Glow Moon Blasters for each child in Arena B. Kids and parents are easy targets for the soft pong balls that Glow In The Dark as they soar through the air. Select times only. Includes our Glow package, Karaoke and Red Carpet Runway. Take your party to a whole new level, with a visit from one or more of our special characters. Our characters will surprise you and your guests with a visit to your party in our arenas. We will play music that coordinates with your character visit as well as interact with all of your guests and have photo opportunities to complete this ultimate party experience. Give us a call for our complete list of available characters. Your birthday child will become our Hero of Honor for the day! Guests will go through a series of Superhero training exercises to help them all become true Superheroes! When the Heroes in training complete the Training Camp, they will receive a Superhero Mask. The Hero of Honor also receives their very own Superhero Cape and more! Your birthday child will be crowned as Captain during this adventure, leading their crew of jolly buccaneers on a scavenger hunt, using their map to find the lost treasure, while enjoying tons of Pirate games along the way! Each participating buccaneer will take home some loot from the treasure chest and the Captain will earn their Captain’s hat! 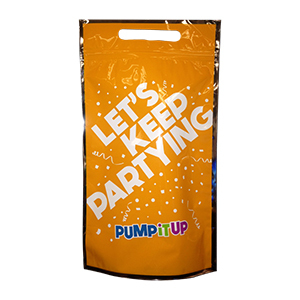 Host an Early Bird Party Special or a Late Night party and have all of your guests wear their favorite pajamas! Great for kids on the go! 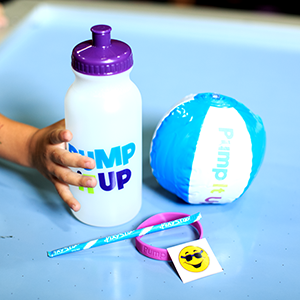 Orange, Blue, Purple & Green Pump It Up Water Bottle includes a Finger Trap, Punch Ball, Tattoo, Alien Parachute & Candy Bracelet. Welcome to kids favorite birthday party place in Marlton!